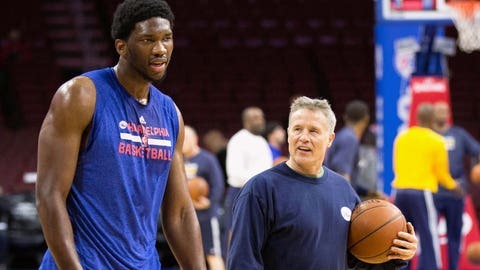 The Sixers signed up for another year of the Joel Embiid experience. The Sixers announced on Friday that they will be picking up the third-year contact options on Joel Embiid and Nik Stauskas, and the fourth-year contract option on Nerlens Noel. This move was an expected one in advance of the Oct. 31 deadline to do so, but even so, it's at least a little bit interesting where Embiid is concerned. The third overall pick in the 2014 NBA Draft has yet to play a single game for the Philadelphia franchise, and is expected to miss a second consecutive season after his foot was found to need a second surgery this summer. This contract decision guarantees Embiid $4,826,160 for the 2016-17 season, and while this was really the only move for the Sixers to make here, it will be questioned by a segment of the fan base if in fact Embiid never is able to reach his potential.